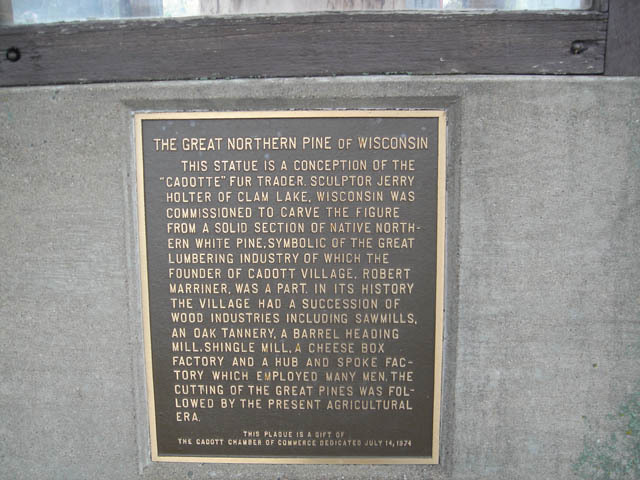 Located approximately west side of SR27 between Mills and Oak St Cadott WI Coordinates Lat N 42:34':22" Lon W 90:24':03"
In 1787 Michel Cadotte, famous Madeline Island fur trader, had a trading post nearby on the Yellow River. Here Micheal Jr. was born, and another son, Jean Baptiste, is said to be buried on the rivers bank. 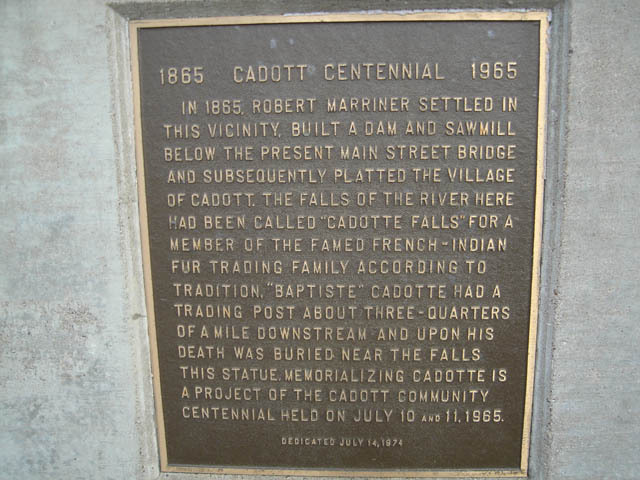 Robert Marriner built a dam at "Cadotte Falls" in 1865 and later named the village Cadott to honor the French-Indian fur traders. 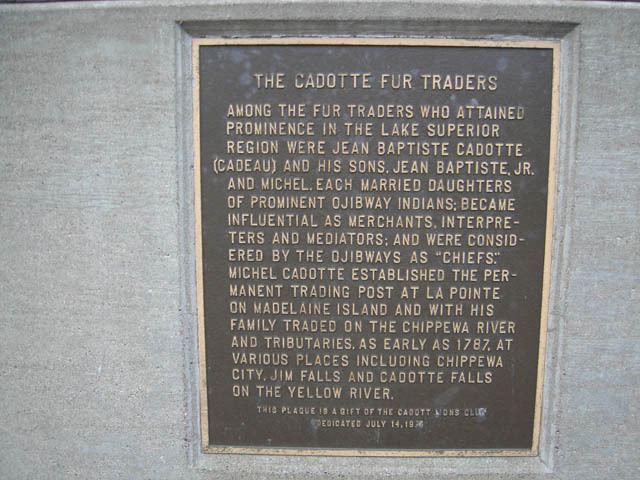 AMONG THE FUR TRADERS WHO ATTAINED PROMINENCE IN THE LAKE SUPERIOR REGION WERE JEAN BAPTISTE CADOTTE (CADEAU) AND HIS SONS, JEAN BAPTISTE JR. AND MICHEL. 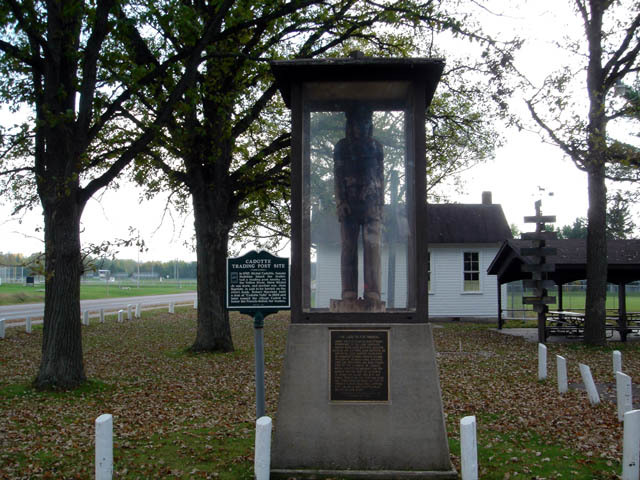 EACH MARRIED DAUGTERS OF PROMINENT OJIBWAY INDIANS; BECAME INFLUENTIAL AS MERCHANTS, INTERPRETERS AND MEDIATORS; AND WERE CONSIDERED BY THE OJIBWAYS AS "CHEIFS." 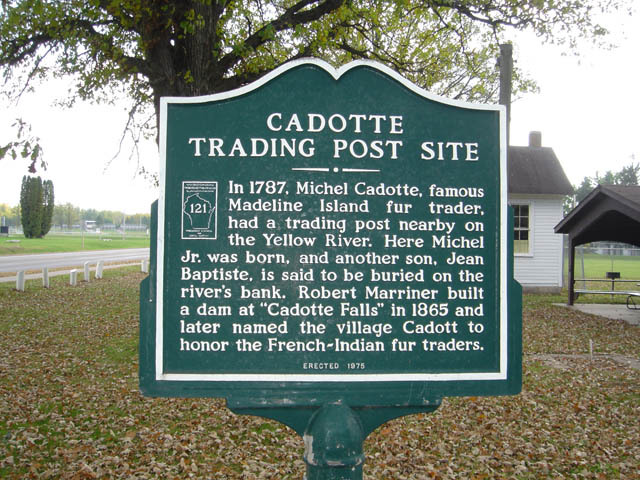 MICHEL CADOTTE ESTABLISHED THE PERMANENT TRADING POST AT LA POINTE ON MADELAIN ISLAND AND HIS FAMILY TRADED ON THE CHIPPEWA RIVER AND TRIBUTATIRES, AS EARLY AS 1787, AT VARIOUS PLACES INCLUDING CHIPPEWA CITY, JIM FALLS AND CADOTTE FALLS ON THE YELLOW RIVER.